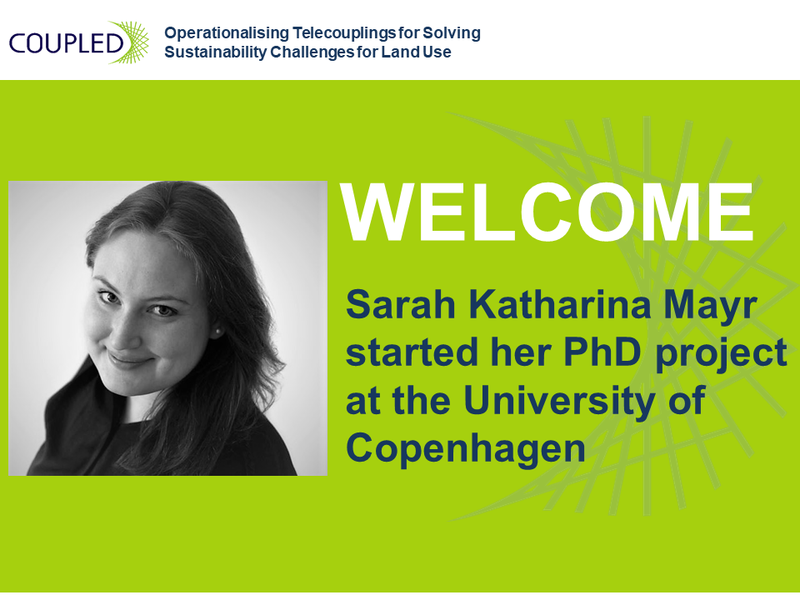 We are very happy to introduce our PhD fellow Sarah! Spill-over effects of demands for certified tropical products in Europe, based at University of Copenhagen. Sarah is an agricultural economist with a Bachelor of Science in Agricultural Sciences from the University of Bonn and a Master of Science in Agricultural Economics from Humboldt-Universität Berlin. Her research interests lies in sustainable agriculture, commodity value chains and livelihoods as well as in biodiversity conservation and climate change mitigation and adaptation. Before joining COUPLED, Sarah worked as research fellow at the Mercator Research Institute on Global Commons and Climate Change (MCC) in Berlin where she was engaged in two research projects dealing with forest conservation and sustainable options for the restoration and utilization of degraded tropical land in Indonesia and Brazil. Especially with regard to an increasingly interconnected world, sustainable land management as well as sustainable value chains to ensure the protection of forests as carbon sinks, natural ecosystems and habitats are major challenges, which Sarah would like to contribute to. Considering this, Sarah is looking forward to pursue her PhD in the appealing research environment provided by the combination of excellent institutes and researchers in COUPLED. Moreover, she sees the group of 15 PhD students with different backgrounds, experiences and skills as a major incentive and benefit of such an European Training Network. As an agricultural commodity that is literally everywhere, in products as well as in discourses involving stakeholders at all levels, palm oil has already caught Sarah’s interest many years ago. While the rapid expansion of palm oil plantations in tropical countries has brought significant benefit and profits to the countries’ economies and to companies and corporations, the oil palm boom also comes at high negative external costs, particularly as negative ecological and social consequences. Her PhD project focuses on the very complex and globalized palm oil network and on exploring indirect and unexpected (spill-over) impacts of palm oil certification. The objective is to understand flows and institutions linking actors at all levels to processes and spatial outcomes and, on that basis, to actually attribute impacts to drivers in telecoupled palm oil systems. Again, a warm welcome to you, Sarah! We are looking forward to a successful cooperation in the upcoming years. You can find more information about Sarah’s research project here.